My name is Joseph Richard Tanner and I’m proud to be a representative for C-R-Y and all the work they do. I hope to further raise awareness for C-R-Y in this role and be an advocate for C-R-Y in this position. 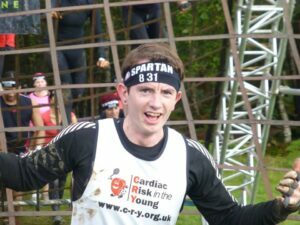 I got involved with C-R-Y after suffering a Cardiac arrest in 2008 at the Hastings Half Marathon, after a 3 week stay in hospital I was diagnosed with Brugada Syndrome. I soon became involved with C-R-Y, I have run many charity events, ran a store in a local shopping centre in Brighton. I was also co-author of the C-R-Y publication myheart Booklet and I regularly attend myheart meetings to support people coming to terms with their heart condition. One of my main goals would be to get C-R-Y publications out to the families, to make sure they have the support when needed. A family should never suffer the loss of a young person to an undiagnosed heart condition/ a young person feel alone after being diagnosed with a condition.